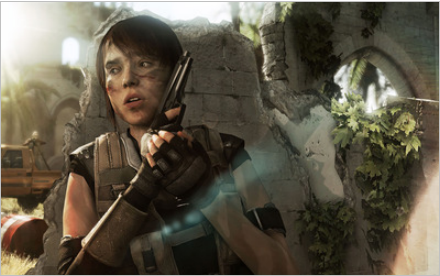 Beyond: Two Souls is a convoluted, non-linear, rebellious, and emotionally taxing game. And… I LOVE IT. In general, video game story lines have improved considerably over the years. However, besides the occasional RPG gem (ala Mass Effect and the like), most narrative-driven games fail to deliver true cinematic quality. Beyond: Two Souls, despite its faults, fulfills its promise of giving its audience an authentic cinematic experience. And what an experience it is. If you have yet to play a Quantic Dream game you’re in for a pleasant surprise. Like its predecessor Heavy Rain, Beyond: Two Souls tells a compelling, character centric narrative. The game allows the player to dictate the direction of the story through its engaging, choice-driven gameplay. Beyond: Two Souls also introduces many new features that improve on Heavy Rain’s gameplay, like the new right-stick interaction system, and free flowing action sequences. Of course the biggest change in gameplay comes from the ever-present companionship of Aiden, who is always by Jodie’s (Ellen Page’s) side. Aiden can be controlled almost anytime with a simple tap of the triangle button. Because Aiden is essentially an un-bodied entity, using him opens up gameplay mechanics that define the Beyond: Two Souls experience, like being able to phase though walls and take control of other human beings. The game’s gameplay also has some interesting action and shooting sections, which despite their simplicity prove to be genuinely fun and suspenseful. But enough about gameplay; lets get down to the main selling points of Beyond: Two Souls, its plot/story, and the performances of the people who have been given the task to act it out. The story is very good, borderline great actually. The twist and turns, the interesting characters, and the satisfying ending all make up a story that can hold its own with even the most compelling Stephen King novel. However, what keeps the story for being great is the manner in which it is told; instead of going with the linear blockbuster film-like sequence of events that worked so well in Heavy Rain, Beyond: Two Souls chose to go with the non-liner approach. Because of this, the game’s levels (events in Jodie’s life) are not presented in a “1,2,3…” sort of way, instead they come at players in a “5,3,7,1..” manner. Going with this sort of story progression was bold decision by Quantic Dream, and while it does have its moments, a liner approach would have worked much better with the complex story of Beyond: Two Souls. Ellen Page simply steals the show as Jodie Holmes. Ellen has had growing success as an actress, but none of her past work could have prepared me for her performance in Beyond: Two Souls. There isn’t a single point in the game where you feel that Jodie isn’t a believable character; the way she talks, how her emotions are conveyed, and her relationship with Aiden, all feel genuine and relatable. Throughout your playthough of Beyond: Two Souls I can almost guarantee that you’ll feel the same emotions Jodie feels at certain points. William Defoe delivers an admirable performance as Nathan Dawkins, Jodie’s “caretaker” and father figure. The other, lesser known, actors who comprise the rest of the game’s cast all give great and memorable performances as well. 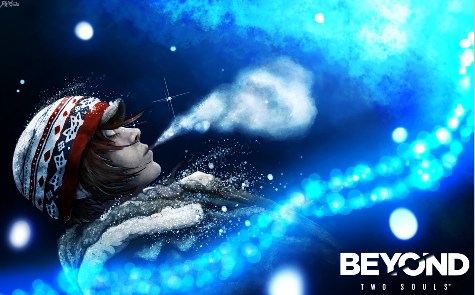 Beyond: Two Souls is one heck of a game and is a must own for any PS3 owner. Being the first game to ever have two Oscar nominated actors in it not only makes this game a collectors item, it makes its character driven narrative all the more worth experiencing. The game falls just shy of being great, but despite its faults its still an amazing trill ride that will often have you on the edge of your seat, or on the verge of shedding a tear. This entry was posted in Aiden, beyond two souls, Comic Book, ellen page, Franco Romualdez, Heavy Rain, Jodie Holmes, Nathan Dawkins, ps3, Quantic Dream, stephen king, video game review, William Defoe and tagged aiden, beyond two souls, ellen page, Franco Romualdez, heavy rain, Jodie Holmes, Nathan Dawkins, ps3, quantic dream, stephen king, video game review, William Defoe. Bookmark the permalink.